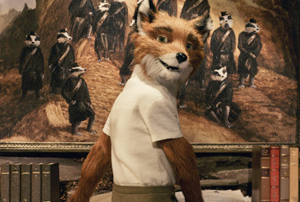 Director/writer Wes Anderson’s adaptation (with an assist from Noah Baumbach on the screenplay) of Roald Dahl’s, er, tale, of a naturally-thieving fox who tries to go straight is a visual delight that doesn’t dig too deep into the allegorical subtext that made George Orwell’s Animal Farm such a brilliant piece of fiction. Cinematographer Tristan Oliver and supervising editor Andrew Weisblum do yeoman’s service bringing the storyline of the reformed fox moving out of his old, literal digs into an upscale Walt Whitman tree that, not coincidentally, affords the wily journalist (one can’t get more reformed than abandoning incessant pilfering for a life of writing columns that no one reads!) a daily view of farmers Boggis (Robin Hurlstone), Bunce and Bean (Michael Gambon). Before you can say “off the wagon,” Mr. Fox, his nephew and the leafy condo’s superintendent, Kylie (Wallace Wolodarsky) are surreptiously filling the family larder with the spoils of their nocturnal expeditions. Not surprisingly, the humans band together to track down their profit-killing, furry neighbours, but, in the early going, have to settle for a tie. The Fox clan goes through some problems of its own as the two cousins vie for acceptance and mom tries to lay down civil law.